Vintage - GSA (Girl Scouts of America) Official Folding Pocket Knife, with GSA Emblem, from the 1960's. This is a Vintage Girl Scouts of America Official Folding Pocket Knife from 1958 thru 1970. Made by Kutmaster of Utica, N.Y.. There are (4) Blades, Utility, Screwdriver, Bottle Opener, Awl and Can Opener. Has a Girl Scout Green Enamel Cover, with the GSA Emblem. Knife Measures 3 3/8" Closed, and 6" Open. Pocket Knife is in great condition considering age and usage. 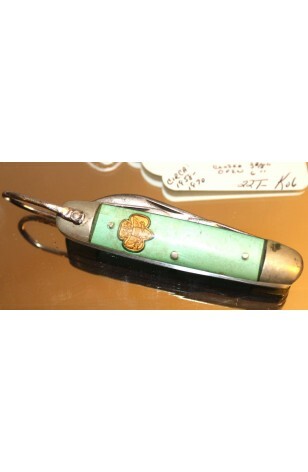 This is a Vintage Girl Scouts of America Official Folding Pocket Knife from 1958 thru 1970. Made by Kutmaster of Utica, N.Y.. There are (4) Blades, Utility, Screwdriver, Bottle Opener, Awl and Can Opener. Has a Girl Scout Green Enamel Cover, with the GSA Emblem. Knife Measures 3 3/8" Closed, and 6" Open. Pocket Knife is in Very Good Resale Condition considering age and usage.